A Haven For Flight Simulation Enthusiasts! There is always something new waiting in the wings, always a shiny penny to replace its dull and scratched counterpart, always a brighter tomorrow promised today. The Airbus A350 XWB Advanced is just like our shiny penny. 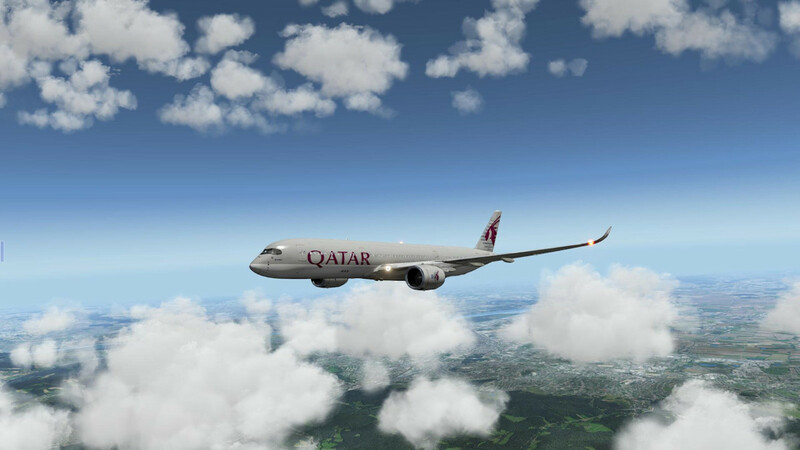 This brand new aircraft is barely in service, with Qatar Airways only launching its first revenue service in January 2015. The A350 XWB (extra wide body for those who are wondering) is perhaps an odd choice for a flight sim developer to tackle. Airbus is notoriously unhelpful to developers, with many an A320 model having to be reverse engineered with the help of a friendly airline or pilot. So taking on the newest aircraft with barely a few thousand hours flight time under its belt may seem a little foolish. 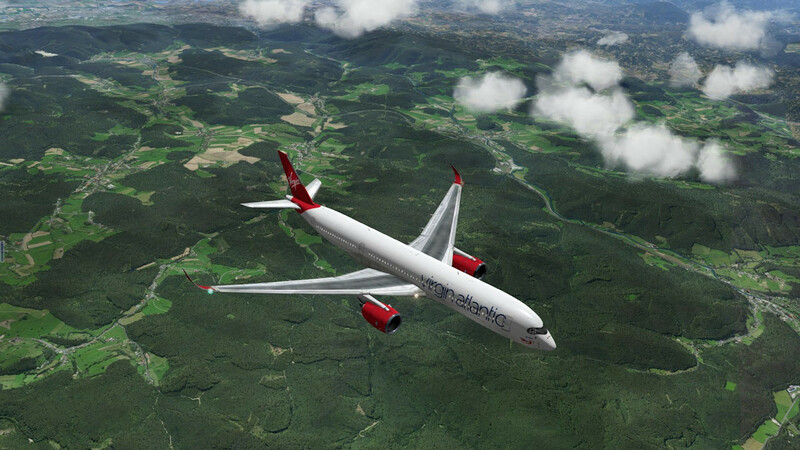 X-Plane heavy metal specialists, Flight Factor, have done just that. The question is, “Is it any good?”. Flight Factor have produced some wonderful aircraft. Their Boeing 757 is excellent and even the the ageing Boeing 777 Worldliner is enjoyable. The A350 XWB though, is in a whole different ball park. There are no steam style gauges to be found on this most modern airliner. 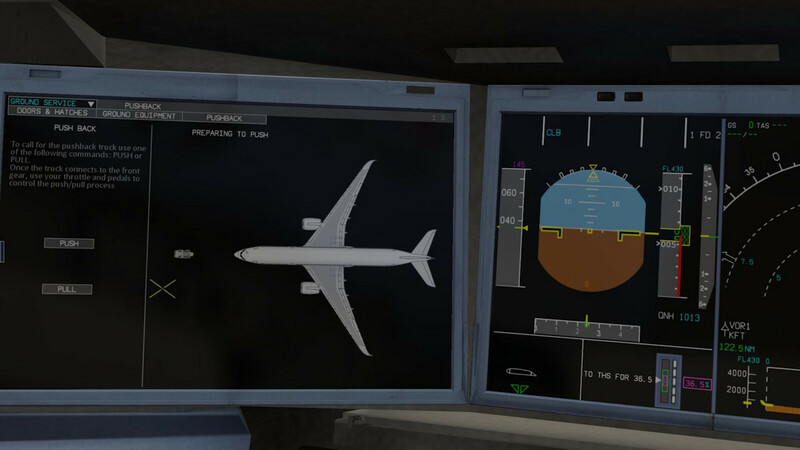 The A350 XWB is an aircraft for the computer generation. Almost everything about it screams modernity. The wings are carbon fibre along with parts of the fuselage. The cockpit looks more like a flight sim setup with six, 19 inch screens crammed in there to display everything and anything the aircraft is doing, or not doing. This paperless office in the sky is as modern as Millie was and then some. So it is with some trepidation that I approach this aircraft. I cut my teeth flying airliners in flight sims on the old Boeing 767, before transferring to the Boeing 737-800. From there though, I grew to like the Airbus A320, and it has been my constant companion ever since. Thanks to the A320, I have an idea of how Airbus thinks and what to expect. 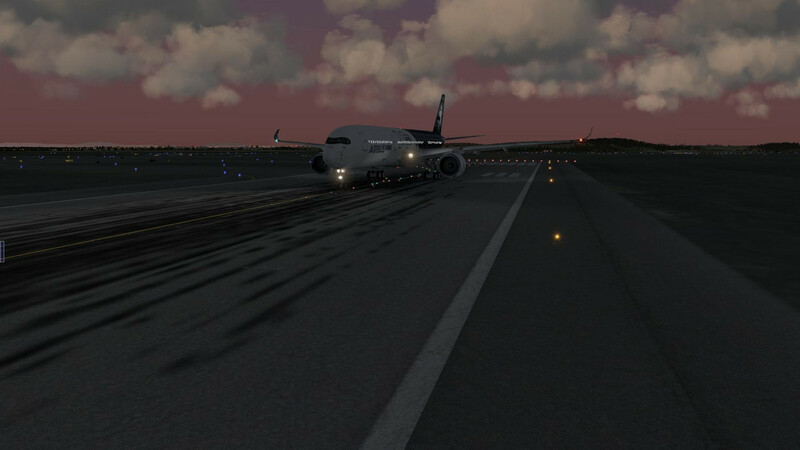 The Flight Factor Airbus A350 XWB Advanced is currently available direct from the store at X-Plane.org as a 'download only' product. It is priced at US$49.95, or the equivalent on currency cross rates. 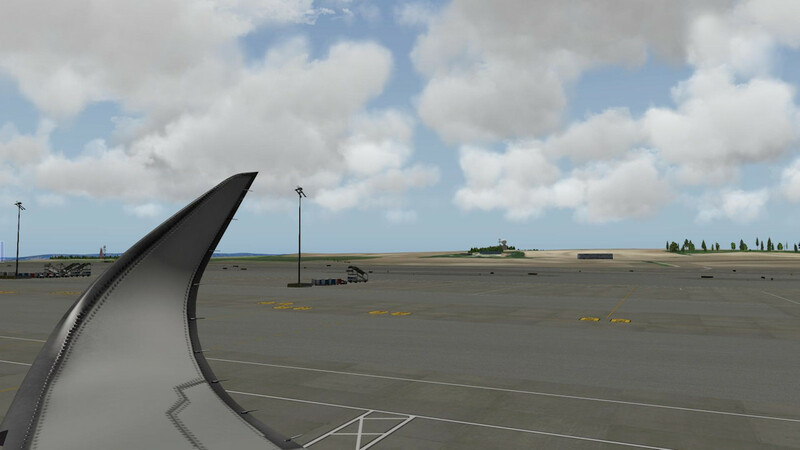 The first port of call for the A350 XWB is the outside. Flight Factor are excellent airframe modellers and the A350 XWB looks beautiful. The stand out feature of this aircraft is its blended winglets. These sculpted beauties merge effortlessly from the wing and set the aircraft up to look its best. The rest of the aircraft is not bad either. The large Rolls Royce engines look great, with no signs of harsh edges. The cockpit windows look a little odd with the inclusion of a black band around them, giving the aircraft an odd superhero look. The band reminds me of TWA's old 747-100s. They also had a large black mask painted to avert glare for the pilots. The A350 XWB's band is more subtle though. Lighting wise, the exterior model is well covered, with X-Plane's default HDR lighting looking stunning as always. Finally, keep an eye on the wing flex, which looks pretty nice. Stepping inside the aircraft and you will notice the cockpit is well modelled, just like the outside. In an odd way, it is both vastly different, and yet, strangely familiar. Airbus pilots will feel more than at home here amongst the 'Airbus blue' panels. Moving around the cockpit, there are plenty of nice details. 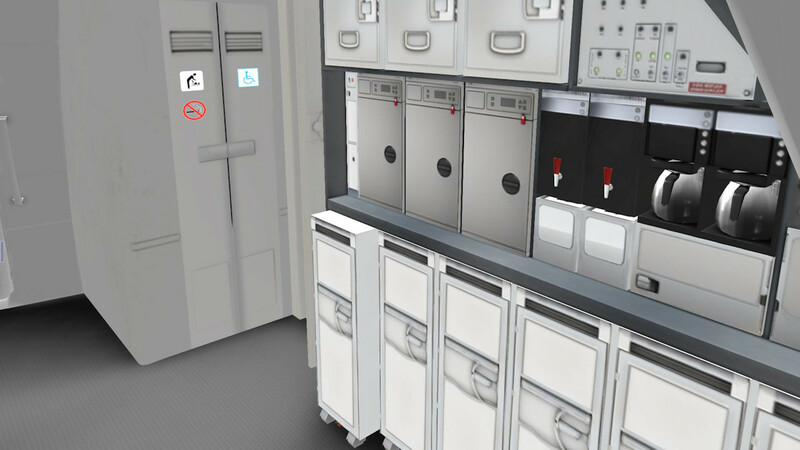 From the captain's cup holders through to the file cabinet come closet which holds the pilot's jackets, it is clear there is a fair amount of attention to detail gone into making the cockpit. As with other Flight Factor aircraft, opening the cockpit door allows you to wander around the passenger cabin. It is nicely done, with not too many polygons wasted on getting it to the same standard of the rest of the aircraft. The odd person sitting around in their seats can seem a little creepy though. One woman's eyes seem to follow you around the cabin. Getting down to the nitty-gritty, what is the aircraft like to fly. Selecting one of the seven liveries supplied with the A350 XWB, I set out on a fairly short haul flight across Europe to find out. To be fair, this aircraft will handle long haul with ease, but as a 'getting to know you flight', a two hour flight to Salzburg seems far nicer. 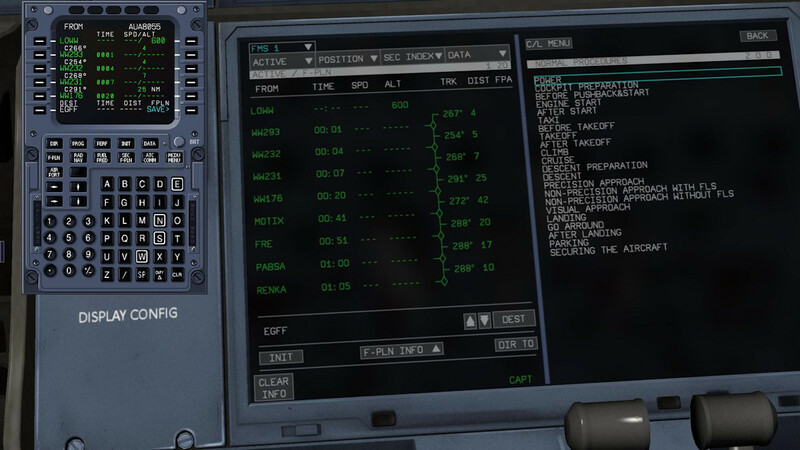 The cockpit is 'cold and dark' when I get loaded up, however my experience with the A320 pays off. The overhead is very similar and it is clear Airbus are maintaining the 'common feel' they have across the range of aircraft types. 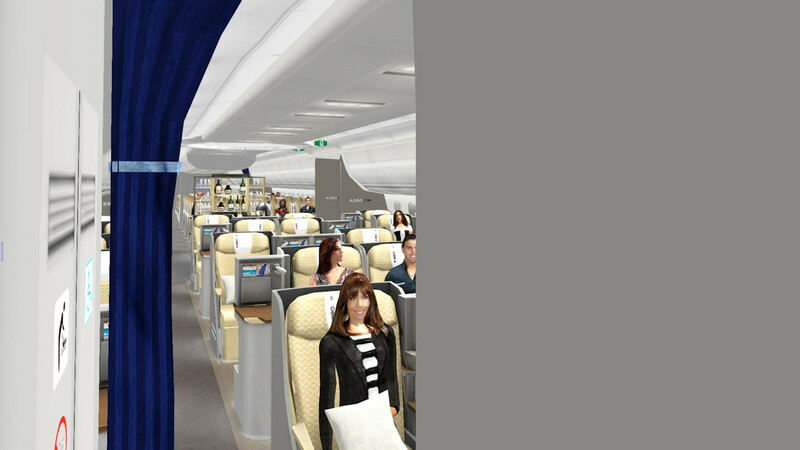 The layout, whilst slightly different in places to make way for the new technology, is more or less the same to an A320, A330, and so on. So finding the batteries, the APU, and other systems is simple. With the aircraft powered, the vast screens pop into life. The main PFD and ND are more or less as expected and positioned across the screens in front of the pilots. The PFD features the flap display, a change from their standard methodology of placing it on the central panel. The ND features a flight path descent monitor to keep an eye on the terrain below. The ECAM displays take up the top centre monitor. 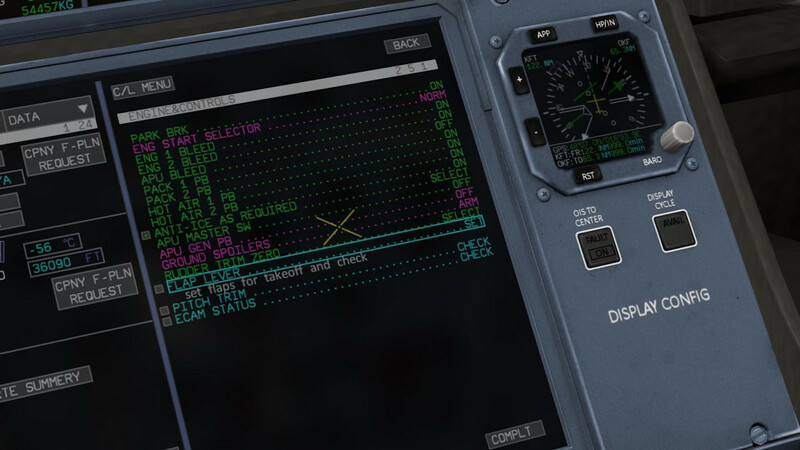 Finally, the lower display operates as the MCDU and electronic checklist for most flights. Most of these displays are reconfigurable, so if a fault occurs on one screen, the data can be switched to another screen easily. Even for seasoned pilots, there is a lot of data available here to the point of being almost overwhelming. 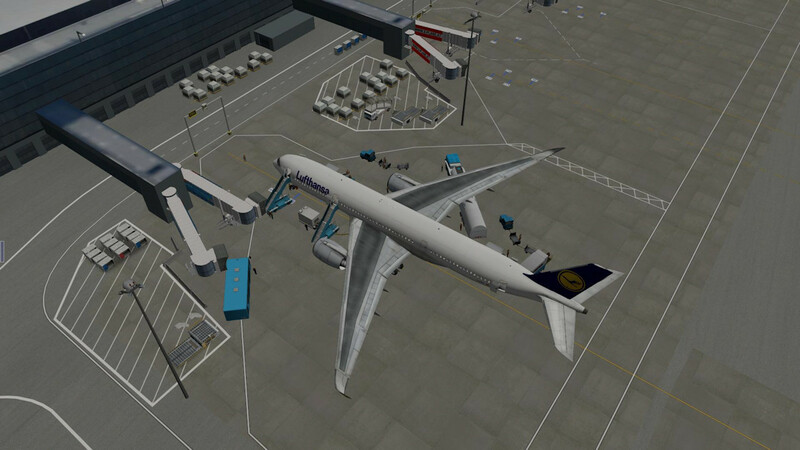 It is also going to need careful integration with the sim to make it all work together - more on that later. 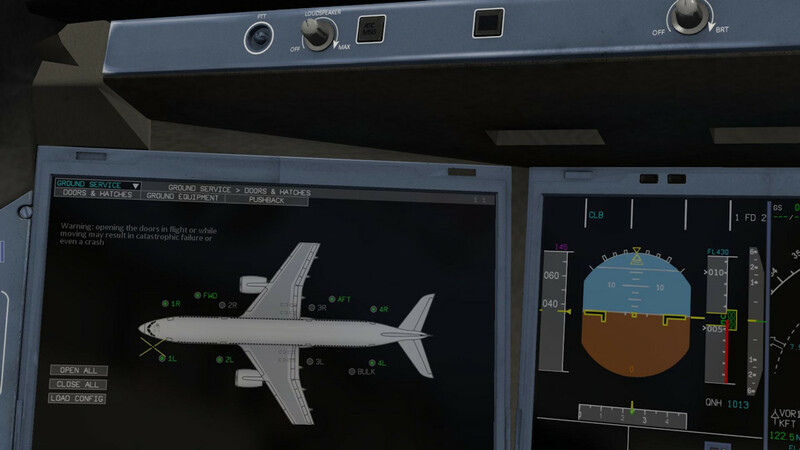 The final two displays, the pilot and co-pilot side displays, are used on the real aircraft for everything from a chart viewer to a flight planner. 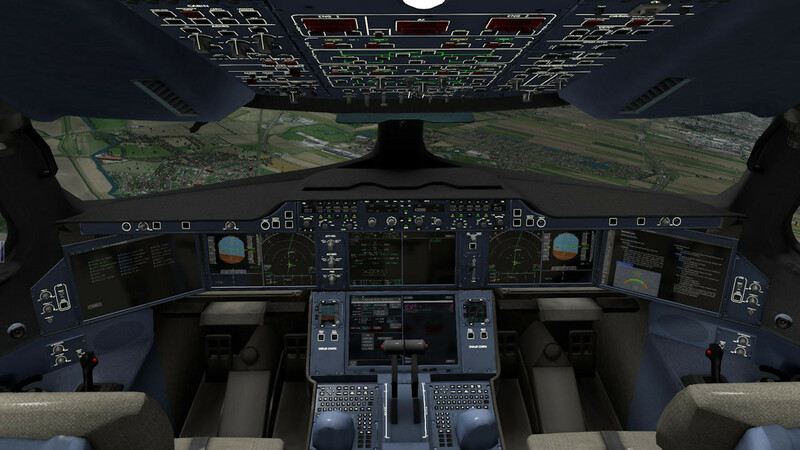 In the sim, Flight Factor have chosen to use the captain's display for a host of sim options. 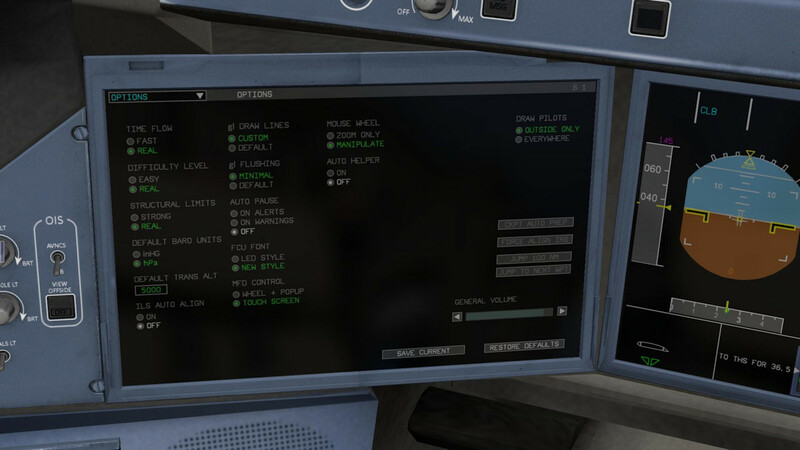 The co-pilot's display shows a picture of the in sim manual for the aircraft. Moving to the captain's display, there are a host of options to get things running. The first are the ground handling options. From refuelling to pushback and a plethora of things in between, the A350 XWB has it all. The options are accessible with your mouse, which makes the transition from the 'VC' to 'on screen cursor' easy. This is also true for the MCDU display and the electronic checklist. It is a system which works well, and watching the animated traffic come and go around the aircraft is nice. Away from the ground options, there are more options for the PA announcements, covering everything from “Welcome aboard” to “Welcome to our destination”. It is a great little feature which adds to the ambiance of the whole aircraft. Also worth mentioning is the cabin purser is interactive and if something is wrong, he will call the cockpit to let you know. The last page gives you a set of options for sim realism. Here you can set the difficulty level, mouse scroll wheel function and several other options besides. There is also a final page dedicated to the on-board manual and also an option to display real world charts on the On-board Information System (OIS). Flight Factor have helpfully included a small program which will convert a .pdf file to a .png image file. This allows the charts to be seen in the cockpit and it is a nice touch. The MCDU may be lacking but the rest of the aircraft's systems seem fine, and with the IRS aligned, the route installed, and the cabin ready, it is time for pushback. 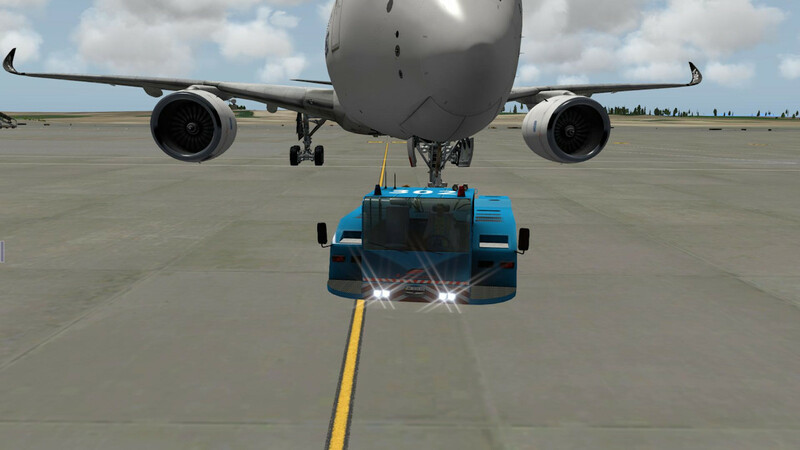 Heading over to the captain's OIS, I call the pushback tug forward. I like the pushback system a great deal. 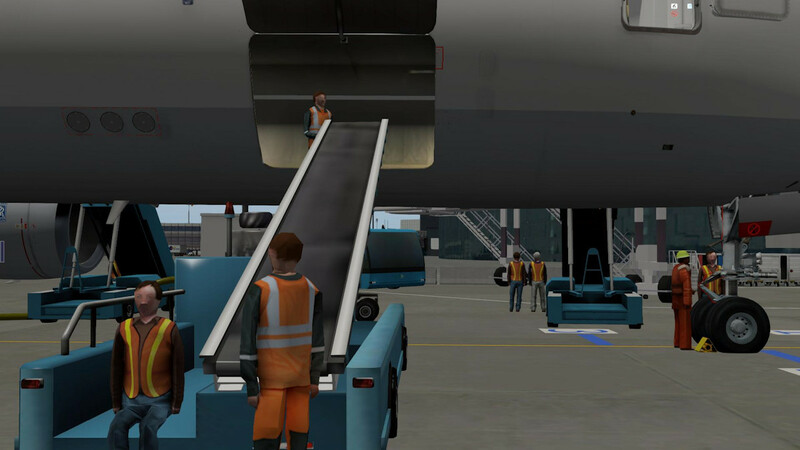 Rather than trusting a pre- defined 'bot' to push the aircraft back, Flight Factor have given you total control of the pushback operation. 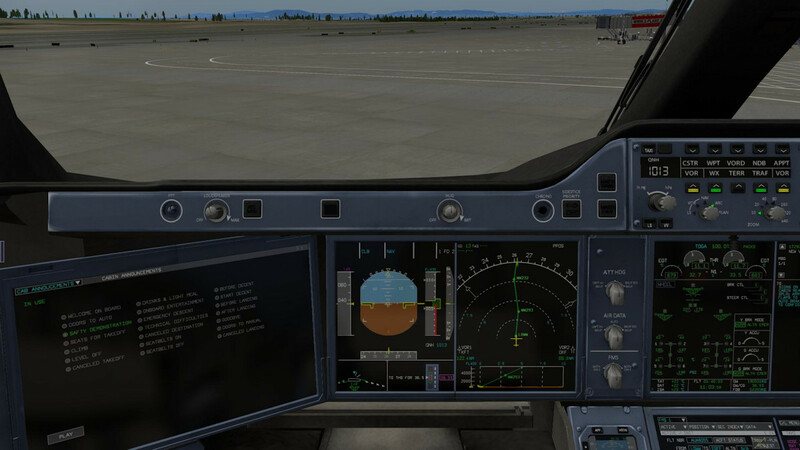 With the tug connected, and you will know when that happens because it will display the tug on the screen, you release the parking brake and then you use your own throttles to control the speed of the pushback. 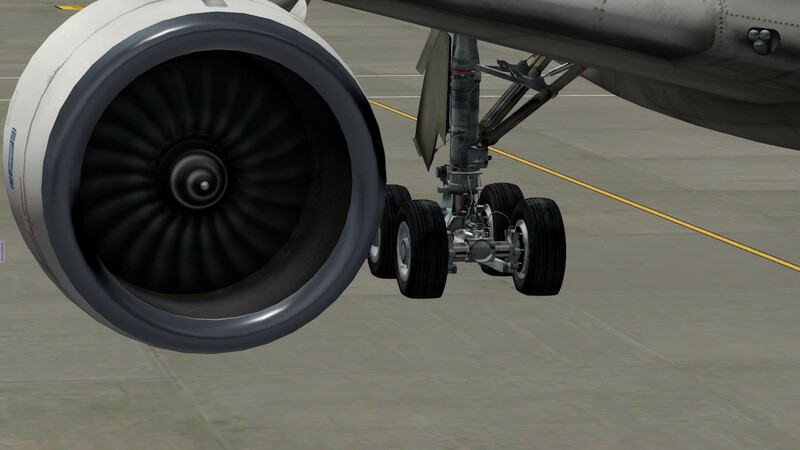 The throttles will be disconnected from the aircraft, so starting the engines as you push will not cause any surges. Turning left or right is as simple as using the nose wheel tiller or your rudder pedals if you do not have the tiller set separately. It is a real elegant solution to pushback and it works well. Now that the engines are running, I taxi out with my FCU set. 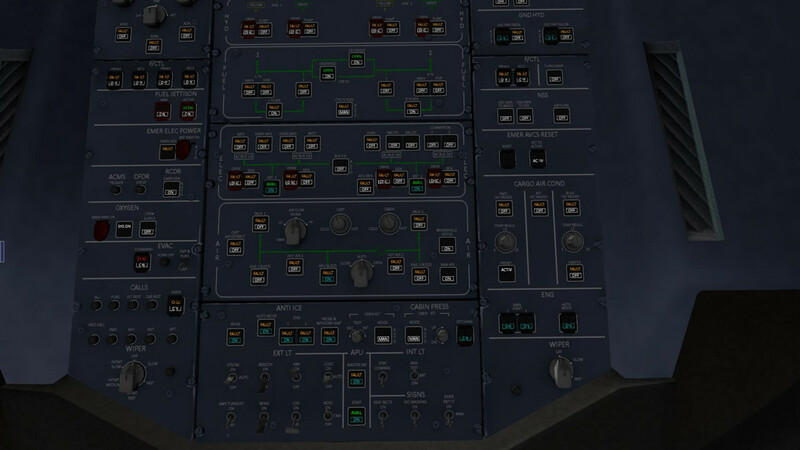 The FCU is always a tricky prospect for any sim Airbus. With options to push, pull, and rotate some items, it can be a nightmare for developers to show what option you have pushed. Flight Factor have done extremely well here, with several different cursors in use to describe what function you are using. To push a button, you get a pointing finger, to pull, you get an open hand. To rotate a dial, a circle with arrows pointing up and down indicates you can use your mouse scroll wheel. Arrows pointing left and right indicate a left or right click will change between 100 feet and 1000 feet options on the altitude display. It is very well done and easy to grasp. Talking of the engines, the sound set is excellent. The X-Plane sound system is not the best but the A350 XWB sounds great, if a little quiet. I suspect this is exactly as it is supposed to sound though. As I advance the throttles to take-off though, a lovely deep bass note fills the air as the A350 XWB rumbles down the runway. As I pitch the nose up for take-off and leave the ground, I get the first feel of the A350 XWB in flight. It is no joke to say this aircraft is a real joy to hand fly. The Airbus fly-by-wire system works perfectly and the various flight safety systems work as they should, with banks limited to 45 degrees, along with pitch restraints and alpha floor protection as well. With the climb set though, I hand over to the FCU and let 'George' take the strain. The autopilot works fine and all too soon I am at the Top of Descent (TOD). Again, the MCDU is lacking this function, so it is a matter of using maths to calculate my own TOD. As the aircraft lines up onto the approach, I notice that the flight computer does a good job of reducing the speed as I drop the flaps, just as it should. Switching to hand flying, and the A350 XWB is putty in my hands. I land easily and all too soon I am on the stand and shutting the aircraft down. Performance wise, the A350 XWB is very FPS friendly, with frames at their lowest in some very heavy scenery areas and dropping to the low 20s. That is not bad over three screens. The documentation is a little on the heavy side. It deals primarily with descriptions of the aircraft's systems. 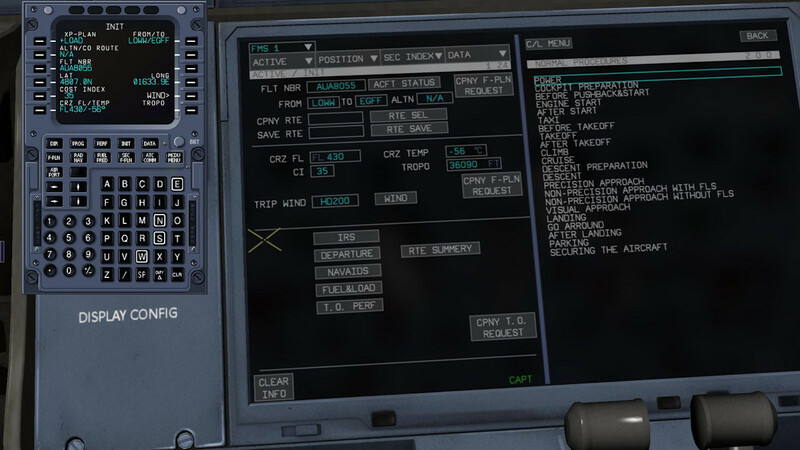 There are a few sections which deal with setting the aircraft up via the 'settings screen', but nothing on how to fly the aircraft. What it really needs is a tutorial to help new pilots get use to this very new style of aircraft. Given the aircraft's price point, I expected more. I do not like is the cost of the extra liveries. OK, US$10.00 a pack is not too bad, but with four packs available, you could be paying nearly the full cost of the aircraft just for repaints. True, the repaints are by X-Plane livery specialist, Emma Kate Bentley, but it still leaves a bit of a sour taste in the mouth. • 4GB RAM, 1GB VRAM. • additional add-ons include: Real Terra Haze; and Skymaxx Pro 2. I will be honest and say that I like the A350 XWB Advanced. I like its looks, I like its style and the provided liveries are beautiful. So too is the cockpit, where HD textures abound and clever use of X-Plane's new mouse scroll wheel option make this aircraft a joy for the senses. However, in places it feels like style over functionality and substance. There is no getting away from the MCDU and its missing functions. Whilst it is possible to work around the lack of SIDs and STARs, the missing 'Next Airway' option is a harsh blow. Add to that the missing 'Perf' menu functions along with the Missing 'Fuel Pred' and flying the A350 XWB “by the book” is like trying to win the three legged race with a corpse. Sure, it can be done, but it is not as easy as it should be. It is a real shame too. Another gripe I have is with the ambient noise on the ground. With the ground equipment in place, the sounds of machinery working are just too loud. Given that the cockpit door is shut, along with the windows, the outside noise should be more of a distant hum. Away from the problems though, the A350 XWB Advanced is still an aircraft which is worth picking up. 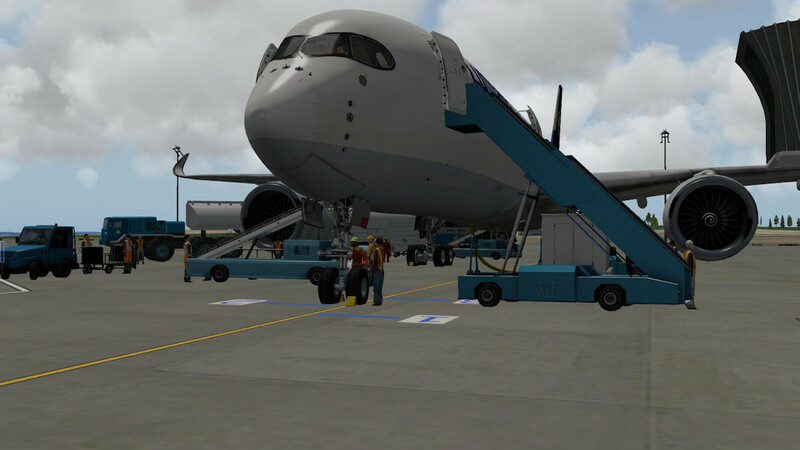 The little touches, from the PA announcements, to the ground vehicles, and more, the A350 XWB is a really good addition to any X-Plane install. The custom failures certainly add spice. It is only the missing features which stop it from being great. A good aircraft that is just waiting for a push to be a great aircraft. Excellent model with excellent textures. Great 'added value' options, such as the ground crew. Documentation lacks detail on flying the aircraft - a tutorial would be nice. External ground sounds are a little 'over the top'. 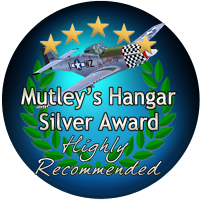 with an "Highly Recommended" and a Mutley's Hangar Silver Award.